« Will the new NHS report on Diabetes make any difference? The development of diabetes? It’s all monkey business! By an amazing coincidence – if you actually believe in coincidence – I was relating the part that our human evolution plays in the diabetes problems we are faced with in modern times. Then low and behold, the news is that a zoo in Devon is weaning its monkeys off bananas for health reasons! Some 22 million years ago, before the dawn of man, the prehistoric apes were centred in the African rain forest. Their main diet was an abundance of fruit – straight from the trees, sweet with natural sugar, all year-round. Of course Africa was a very different place 22 million years ago, and still had to go through its own ancient climate changes before it emerged as the place we would recognise today. Those changes led to a migration by some of the apes out of Africa to settle in the rain forests that then covered ancient Eurasia. As the climate changes continued and the land became cooler, the tropical groves rich in fruit were replaced by deciduous forests – and a lack of fruit. Without the year-round abundance of fruits, our evolutionary ancestors faced famine. And here we see the crux of our modern problem beginning to emerge: rather than die, the apes experienced a genetic mutation that made them amazingly efficient at processing fructose. So efficient that even the small amounts they could find were easily stored as fat. This gave them an advantage: survival in winters when food was scarce. The next stages of evolution saw the emergence of the apes we know today, and eventually humans. Today all apes, including we humans, still share that genetic mutation. We still love the sweet taste of sugars, and, at the same time, are amazingly efficient at processing and storing it as body fat! In times gone by that mutation preserved the lives of our ancestors through lean times, but in modern times it presents us with a huge health crisis. Our food chain is flooded with fructose, even though our bodies have evolved as the ultimate sugar-processing factories. It’s not just that we don’t need very much, but because we can so easily lay it down as body fat it is positively harmful to us – leading to the specific patterns of overweight and obesity linked with diabetes and other serious inflammatory diseases. Fruit cultivated for humans is much higher in sugar and lower in protein and fibre compared with wild fruit. It’s that sweet tooth preference thing again that we humans have held on to in all our years of evolution! So the monkeys in our zoos find themselves eating an adapted diet – we feed them our fruit, not the type their bodies have evolved to tolerate. And they are experiencing the same consequences that too much sugar has for we humans: tooth decay; diabetes; digestive problems. Them eating our fruit is absolutely the equivalent of us consuming too many cakes and sweets. Their experience holds up a mirror reflecting the consequences of our own diet and lifestyle choices – if we choose to see it. First – a diet packed full of leafy green vegetables is so much more beneficial than one laden with sugar – a simple fact of which we are so often in denial. Food in its original, natural state helps where food cultivated or manufactured to contain higher sugar levels harm! Second – if we lounge around in our homes instead of metaphorically swinging through the trees – exercise to you and I – our bodies will be less tolerant of our inappropriate diet. The monkeys in the zoo are limited by their enclosures – we have no such constraints or excuses for not moving around more. 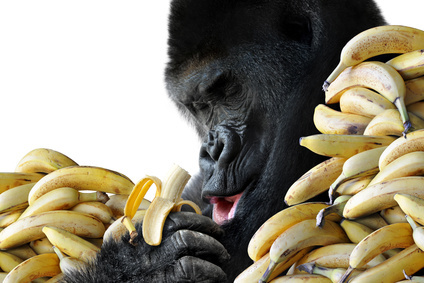 So for a healthy 2014 – let’s get down with the monkeys and back to the way our own natures intended! This entry was written by rebalancediabetes, posted on January 15, 2014 at 3:12 pm, filed under diabetes, Education, RebalanceDiabetes, the 6 diet. Bookmark the permalink. Follow any comments here with the RSS feed for this post. Post a comment or leave a trackback: Trackback URL.